Alarms sound off throughout the south Monsteropolis Energy Processing Plant. Security doors slam shut as sector after sector is cleared, leading inward from the sealed exterior. 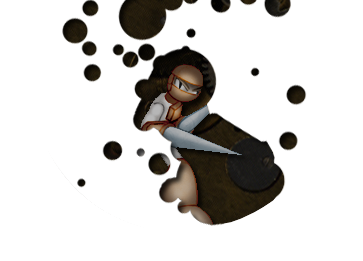 The Mechanical Maniacs are spread out through the complex, combing the hallways for the intruders behind the incident. A Search Snake slithers ahead of each of the Maniacs besides Snakeman himself. The team members coordinate through the communicators in their heads. Snakeman: No! Ben, for the last time, I will let you know when your target is in sight. Assume anyone else works here. Needlegal: They would be standing around, actually. That's the point of a lockdown. Nobody goes anywhere until we give the all-clear. Magnetman: Security in this place is tighter than a plutocrat's purse on Sunday. What kind of sparse-minded idiot thinks they can get away with breaking in here and getting out in one piece? Shadowman: They must have thought their holographic disguises would get them in and out with all the E-Tanks they could carry. One momentary flicker was all it took to set off the warning bells though. The reports say there are at least three that tried to fight their way out before going back into hiding. Snakeman: And that's when we were called in, and that's why we're relying on my Search Snakes' ability to detect their holograms. Hardman: Okay. Thanks for the exposition of everything we went over in briefing before coming here. Snakeman: You're the one that was acting like you couldn't remember! Hardman: I just want to punch something, alright? I figured that would be obvious by now. Geminiman: Well you'll get your chance soon enough. They're running out of room to hide. Topman: Oh, great. Alright, everybody up against the outer wall! Snakeman: I think that's everyone that's coming. I'm picking up some "stragglers" hiding among the vats, but the energen makes it hard to pinpoint them from out here. Shadowman: Then in we go. Hard, Magnet, Gemini, Needle, stay out here and watch the edges. The rest of us, pick a row and move quickly. Spark Chan: Do I have to ask, Raijy? Snakeman: He's shimmering. Zap him. Worker 3: Damn you cops! We just wanted energy to feed our families! Urk! Shadowman: (Pulling his sword from the impostor's torso) Sure, your robot family. Good excuse. Spark, Snake, what's your status? Spark Chan: I'm fine! Snake is down...but twitching. Shadowman: Ouch. Look after him. Hardman: Watch out. Chemical spills like that typically mean he either just got super powers, or is now disfigued and criminally insane. Possibly both. Worker 4: (From a catwalk overhanging one of the vats in the middle of the room) Back off, man! If I drop this grenade into the energen, this whole place goes up and we ALL die! Magnetman: (Jumps up to the catwalk and advances slowly on the robot, pointing his revolver) Do it then. This is just my game! Worker 4: Y-y-you're crazy! I'll do it! I got nothing to lose! Magnetman: (Twirling his revolver, which is now floating a few inches from his hand) Got any more? If you're quick enough, maybe you can drop it before I touch the trigger again. I'm up for a challenge. Topman: (Skating out of the vat maze) Whew! That's all of them! Spark Chan: Yay! That was easy! Needlegal: Stow it. We still need to learn something. Topman: Heh. Why? Do you want to get some for yourself? Shadowman: Hell no. My holograms are way better than this junk. What bothers me is who made this junk. I'd recognize the design anywhere, it's a compact version of Hologran, one of the minions Wily set me up with back in the day. Needlegal: You think Wily made this? Shadowman: Or someone with his notes...but no one has seen Wily tech like this since the old man died. Geminiman: Aha. Sounds like this will make for an interesting interrogation at least. Let's get these failures back to base. Crorq: How will you ever improve if I don't push you! Now, Spark Chan's birthday cake! Spark Chan: (Perking up) You remembered!? Crorq: How much is that now? Shakeman: Th-three-hundred fifty p-percent capacity. Shakeman: I already took the fries! Crorq: What else is left? (Grabs various strewn empty fast-food packages to check if anything remains) Bah! Whatever. Just make the shake already! I'm hungry! Shadowman: Uh...we're going to step outside for a moment. Topman: Ugh! Why don't you just eat the ingredients without making a shake out of them? You obviously don't care. Crorq: What's the point of keeping Shakeman around if I don't utilize him to the full extent of his abilities? How dare you question my management technique! Everything I do is for your own good! Crorq: Now quit wasting my time and give your report! Geminiman: Ahem. Well, after the perps from yesterday's robbery were reactivated, they all individually revealed the same information. They acted alone and got all their equipment from a low-level underground weapons dealer. Magnetman: We tracked him down with relative ease. Some light persuasion and he pointed us to an online message board and a location where he met his supplier. Needlegal: The location was an alley in lower Monsteropolis. No nearby security cameras, no witnesses, no trace of evidence. The messageboard was a dead end too. The supplier covered their tracks and all we could find out was that they move around and don't show themselves often. Shadowman: Well, there is one other thing we noticed. The robbers, the dealer, the message board, everyone involved professed to having motivations of civic unrest. Hardman: "Freeeedommm" as one of those punching bags put it. Geminiman: That theme combined with the supplier's skill at wiping their electronic fingerprints seems consistent with the Catch22 hackers. Crorq: Unless that gives me anything new to take down Catch22, why would I care? Shadowman: What about those Hologran-helmets? Those were definitely Wily tech. This could spell out a connection between Wily and Catch22. Maybe the surviving Wilybots are behind everything. Crorq: (Rolling his eyes) There's a good reason I don't pay you morons to be detectives. It's because you're morons! Unknown Wilytech isn't as uncommon as you think. It could just be something they didn't find when clearing out Wily's old labs. It doesn't matter, it all finds its way into the vault eventually. Crorq: The Wily Machine wing of the Robot Prison! Those helmets are being transported there as we speak. Topman: Oh yeah, I remember hearing about that years ago. It's still around? I thought it was just for holding evidence for Wily's crimes. Crorq: Wily may be gone but his crap sure isn't! Samples of just about every surviving piece of technology he built for his robot revolutions is locked up underground...They actually had ME gathering dust down there for a while before they finally realized my MAGNIFICENCE was too great to be withheld from the world! Shadowman: ...Okay, I have a hunch. Crorq, can we get clearance to look into that vault? Crorq: I don't know, CAN you? Shadowman: ...fine...MAY we get clearance? Crorq: Seriously, I was asking if you CAN. You're so incompetent, I doubt you'll accomplish anything with whatever it is you're thinking. Shadowman: Gah! You want to find evidence leading to Catch22 or not? Because there's a chance this might, and unless you have a new assignment for us, we have nothing better to do today. Crorq: Oh very well. Investigate away! If you think looking at a warehouse of spaceships with skulls on them will somehow lead to the capture of an infamous hacker group, then you're free to face severe reprimands should you fail. Hardman: So the other option was "patrol or something", right? Shadowman: (Walking out) Come on, we're heading to the prison. Don't worry about reprimands. Magnetman: Pretty confident in your hunch, aren't you? Needlegal: More like he knows Crorq will treat us badly no matter what, so why worry about threats? Snakeman: Hey, what did I miss? Topman: Snake! Wow, you're out of the repair bay faster than I thought. Needlegal: And you look...smoother? Don't tell me that getting doused in burning fuel was basically a hot wax. Snakeman: Nope. The exterior's all new. Turns out R&D had been working on new forms to go along with Hard and Magnet, so they were able to equip me with it fairly quickly. Geminiman: Hold on, are you saying there are upgrades for all of us waiting downstairs? Why aren't we swapping out right now? Snakeman: I asked them that, but they brushed me off, muttering something about 'requisite significant damage'. Topman: Oh. They probably want us to wear out the soles on our old bodies before letting us void the warranties on the new ones. Hardman: Well, I'm off to light myself on fire again. Magnetman: Yer already in the latest Hardman body. They're not gonna give you an even newer one if you wreck it. Hardman: Who said that's what I'm planning to do? I just said I was going to light myself on fire. Snakeman: It's pretty cool though. They must have taken into account my own ideas for improvements I submitted years ago. I thought Crorq just threw those suggestion box notes out...or ate them, or something. Either way, it's pretty close to my ideal customization, so I'm eager to try it out. What's on the schedule today? Snakeman: So was I. (Taps helmet) New cybernetic interface system. Great for database work on the fly. Let's do this. Magnetman: Well at least someone's excited. Hardman: Now maybe you understand why I would prefer spending the day on fire. Magnetman: How many X-ray checkpoints does one hallway need? The security in this place makes the lockdown at yesterday's location look like a screen door. Topman: This whole place is full of dangerous contraband. A break-in here would probably be worse than a break-out in the prison proper. Spark Chan: So what was your hunch, Gauntlet? Shadowman: Well, if this is where all Wily tech ends up these days, there's a chance it can find its way out, right? What if those helmets were already in this vault before? Hardman: Really? You think weapons went from this place straight into the hands of criminals? How do you figure that happened? Shadowman: To be fair, I hadn't seen what the security was like until we got here. Still, it's not like we have any other leads and now that we're here, we might as well look into it. Geminiman: I'm still wondering why this even matters. You don't really think this will help in the Catch22 case, do you? Shadowman: Okay, to be honest I'm legitimately curious about those helmets. I knew Wily had been refining the holographic disguise tech for ages, from the room-sized version he used to make Mega Man think he was an alien, to the head-sized version Darkman used to imitate Protoman. Those helmets seemed like the next step in that process. Who knows what else he was working on before he died? Needlegal: So you're nostalgic about your old toys and want to check out the updated models? Shadowman: ...I wouldn't put it that way exactly, but yeah, pretty much. Guardbot: Howdy folks. Got the call from your chief. Inventory list can be accessed from that terminal over there. Elevator to Basement W is through those steel doors. Those helmets you were asking about are packaged up and ready to go. You can head down with me while I store them. Shadowman: Snake, scan the inventory for any other items that match the helmets. I'll let you know if I want to look anything else up. Magnetman: We had to descend into the bowels of the earth for this? Topman: I was expecting a slightly bigger armory. What's with all the unused space? Guardbot: I don't know. This is my first time down here since I started the job last year. From what I hear this floor doesn't get a lot of traffic. Hardman: What's the point then? Snakeman: (Through comm) From what I'm reading, it looks like it was a bigger deal back in the day when Wily was causing trouble on a regular basis. They even set up a research area down there so the government could try to adapt Wily's stuff for their own use, but shut it down a couple years ago when they realized it was all either impractical or obsolete. Now they just hoard it so nobody else can use it. Shadowman: How many items are they supposed to have? From here I count...maybe a dozen? Snakeman: Thousands, but most of it is likely smaller devices like the helmets. They're filed away through the doors at the end of the yellow path. Geminiman: Hah. How could anyone deem these designs impractical? Shadowman: Is there a larger freight elevator down here or something? Guardbot: No sir, the one we came through is the only solid link to the surface. Shadowman: Then how do you get big things like that down here? It's way too deep for teleportation to work. Guardbot: Regular teleportation beams, yes. We have a hard line that links to the top floor for the bulk stuff. Power is kept disconnected until there's an approved transfer. Nothing goes in or out without us noticing. Magnetman: (Inspecting a nearby gun rack) What the..."Mime-o-Ray"? Hardman: Heh, good times. Good times. Snakeman: Okay, so where's he putting those? Snakeman: Got it. So if I cross reference the specs from that inventory entry with the rest of the database...it looks like you can find a nearly identical object designated as a "photonic field generator" in 185-001 in the same room. Topman: Got it. (Opens the drawer)...It appears to be empty. Guardbot: What? That can't be right. What was that number again? Snakeman: 185-001. Checked in two years ago, never checked out. Guardbot: (Looking intently in the empty drawer) No! How can this be? Shadowman: You were robbed. The helmets we're checking in right now are the same ones that used to be in that drawer. Just as I suspected. Geminiman: A few minutes ago you were admitting how unlikely that scenario was. Shadowman: Yeah but I turned out to be right anyway. That's the important thing. The question now is how did they do it? There are only two ways out of here, right? The elevator and the hard line warp. Both are supposed to be heavily monitored. Snakeman: ...Well I'm not sifting through two years of security footage. Shadowman: Start from two days ago and work backwards. In the meantime, the rest of us can look around for signs of some other exit. Could someone have tunneled in without triggering any alarms? Guardbot: I don't know! Oh man they're gonna have my head for this, I just know it. Topman: (Opening random drawers and finding them all empty) I have a feeling that this was a pretty big heist. Snakeman: No kidding. Looking at a listing of the garage area where you came in, there should definitely be more than a dozen mechs parked there. It should actually be filled from end to end. Needlegal: Someone left with that many giant war machines without anybody noticing?! Geminiman: It's a wonder this place hasn't been emptied out completely. We should probably go look at that teleporter. Topman: The walls all look fine. I doubt they forced their way in. Spark Chan: There's no power in this teleporter, just like the guy said. Snakeman: I may not have to go through all that damn security footage after all. There's a gap in the timestamps two weeks ago. So either somebody turned the system off or they went back in and erased the evidence. Shadowman: Or a good hacker. Maybe we were right about this being a Catch 22 thing. Hardman: Uh...guys? Didn't there used to be a Pinbot parked right there? Needlegal: ...Crap, you're right. How did we miss that? Topman: The thief...is still here! And they're using some kind of...I don't know...subspace wormhole transporter to take everything! Shadowman: What does a thief that can get past security like this want with Wily's rusty old scrap? Spark Chan: Did anyone else hear that? Geminiman: Has that thing been activated? Guardbot: WHAT THE HELL? What's doing that!? Shadowman: Brace yourselves. I can't tell where it's coming from. Geminiman: A melt-ray designed to clean up its own messes? Hardman: Honestly? I wouldn't put it past the old man. Shadowman: It looks like that slime is alive and dissolving all the machinery, absorbing it into itself. Topman: Oh, well mystery solved. That's where all the big stuff went. Spark Chan: Yep. No thief here. Let's go. Far away from the gross thing. Shadowman: Um...yeah, we should probably...subdue this...whatever it is. (Throws Shadow Blades, they get stuck in the goo and dissolved) Nope. I have a bad feeling about this. Hardman: What, you're gonna give up after firing two weapons? If this thing is from the Wily collection, you can bet at least one thing in our arsenal is its weakness. Hardman: Well, I did my part. Hardman: I'm not getting that hand back, am I? Needlegal: It's no good...I can feel my chain dissolving. Spark Chan: Nooo! Not...that guy! Needlegal: I'm still stuck here! Needlegal: Oh, that cannot be good. Shadowman: Ben, I think you were onto something before. Hardman: Yeah! Keep shooting at it until we find its obligatory weakness! Topman: I'm not trying Top Spin, I can tell you that much. Shadowman: Sure, there's that, but I was thinking about how you pegged it as a Wily creation. Do you recognize it? Hardman: Eh? Not really. It was a guess. Either someone put it down here or it was here all along, and the latter case would explain how it ate all that stuff without anyone upstairs noticing. Shadowman: That's it! Snake, see if you can find an item in the database that fits this thing's description. Needlegal: (After firing several rounds of her Needle Cannon ineffectually at the blob) No surprises here. Magnetman: My guns are about as useful as yours. Magnetism's having no effect either. Topman: Top bombs just get smothered. If anything is going to work it would have to be an energy weapon! Geminiman: I think my Laser might be doing some damage...but not much. Topman: I think we have a winner! Spark Chan: Yaagh! It's got my foot! Spark Chan: OW! Was that necessary!? Shadowman: Maybe not, but I wasn't going to hesitate and let you end up like Murphy. Spark Chan: All I had to do was zap my own foot and the gunk would have retreated. I was about to do that before you ninja'd in! Shadowman: ...Oh...right. Sorry...Still, that was a badass maneuver though, right? Needlegal: Yeah. It looks bad, but there's no internal damage. The exterior's shot to hell, I can tell you that much. Topman: Wait, if there are droplets, does that mean we'll never be able to beat this thing!? Won't they all grow into giant acid blob monster... things? Snakeman: I don't think there's enough in a single drop to support a full creature such as this. No, I think they'll just die off fairly quickly once off the central mass. Like leaves off a plant. But that doesn't mean they can't cause serious damage if we leave them alone. Hardman: Guys, I'm having trouble outrunning the ooze in this body! (Tendrils of slime reach out and grab his arm) Great, it's got a taste for my fists! Spark Chan: (to Shadow) See? Now set me down there. Shadowman: Ah, right. Everyone! Close in! Needlegal: Huh. No hard feelings then? Spark Chan: (Lowering the force field) Better stay close just in case it decides to attack again. Magnetman: To be fair, we did attack it first. Shadowman: Well if it's a choice between provoking it and letting it eat the rest of these rust buckets, I'm good with leaving it alone for now. Geminiman: What does it do when it's done with the scrap though? Spark Chan: - and worry about it later? Shadowman: I'd rather not let it out of our sight before we know how to deal with it. Snakeman: I think I know what you're looking at now at least. Head back to the filing area and check 140-099. Topman: The drawer had a broken glass container and a dime-sized hole that looked corroded through from the inside. Needlegal: Wow. It was that small when it started? Snakeman: Database says it's a prototype Yellow Devil upgrade. Wily wanted it to be able to heal itself by assimilating its environment. It uses an "Endoplasmic Nanomechanical Disintegrator System". Designation: END Devil. Snakeman: It is, actually! Nobody could figure out how to program in a mass limit, and all tests indicated it would just unstoppably assimilate all forms of matter until the entire planet was consumed. Classic nanotech grey goo scenario. Snakeman: The sample started out yellow, but the color isn't the point. It was supposed to be inactive. If it's alive and growing, we may already be too late to stop it. Geminiman: Ah, but it's not eating everything. Magnetman: It sure looks like it is from here. Geminiman: Well look closer, because there's an awful lot of matter all around us that hasn't been so much as stained by that unsightly grime. Needlegal: Right, the room itself! If it can assimilate anything, it should have melted through the floor by now. Maybe it has some limitations after all. Hardman: Science time again! (Kicks the ground, breaking out a few chunks of cement. He then kicks the largest chunk at the blob. It sticks to the side and slides off without being absorbed.) Yep, I'd say it doesn't care for cement. Shadowman: (Cringing) Was that test worth potentially drawing its attention again? END Devil: Mgrrbbl. (Starts sliding towards the Maniacs). Hardman: Well it was going to come after us again anyway. There's nothing left to eat in here! Spark Chan: Uh, guys? I hate to bring this up right now, but I think a little bit of that thing got into my systems. My leg just went numb. Snakeman: It must be a trace amount since you're not melting already. Spark Chan: I guess someone's surprise amputation didn't do the trick. Spark Chan: We should have just left when we had the chance! It's not like it can go anywhere while it's completely surrounded by the only material it won't eat. Snakeman: I've called in some backup to help contain this thing. Just keep it occupied for a few minutes. Magnetman: That means we'll have to do more than hole up here. Let me try something, darlin'. Spark Chan: Agh! I can't regenerate my force field right away if you disperse it like that! Seriously you guys, you need to consult me before using me to try and look badass! Spark Chan: (Hops onto Hard's shoulder) C'mon Ben. Neither of us may be able to move too fast at the moment, but at least I can keep us from getting melted. Hardman: Sounds like an excuse to charge it headfirst! Magnetman: This thing may be too big already. Needlegal: It's still crawling up the elevator! Shadowman: Hit the wall above the doors! We need to keep it contained! Topman: How're you holding up? Spark Chan: Uh ... not good. My circuitry was compromised and the jolt I gave myself may have stopped the acid, but it's given me some pretty bad shorts. But never mind that; I'm more worried about getting out of here at all! Shadowman: There's still the teleporter...I think. Have we even seen it yet? I just realized it may have been eaten already. Topman: We'll figure something out! (Tossing Top Bombs at the elevator shaft) This would be faster with some Hard Knuckles. Geminiman: Doesn't look like it got any higher than that. Good work, Ben. Spark Chan: Oof. I hope we know what we're doing this time. Needlegal: It really doesn't seem to care. It's just going to keep probing around until it finds another way out. Hardman: Maybe we can distract it by throwing it more of Wily's stuff from the other room. Needlegal: That's just going to make it bigger. Let's do whatever we can to prevent it from getting any worse. Shadowman: It's spreading tendrils everywhere. It's getting harder to dodge. Spark, do you think you can do that force field again yet? Spark Chan: (Shooting Spark Shock to ward off the tendrils reaching for her and Hard.) No, and I can't charge up very fast if I have to keep shooting constantly! Topman: Hey, I think I found the teleporter, at least! Over here! Topman: For now...I don't know how long I can keep the big guy distracted before it wanders over there and melts it. Spark Chan: That's what I've been saying all along! Shadowman: Well...things are definitely going badly enough. Snake, can you get the guards to activate the teleporter? Concreteman: All right! Time to get to workwhat the HELL is that thing!? Galaxyman: It's an alien, surely! That's why they required my expertise! Plugman: Umm...okay...Anyway, the Sterling Sentinels have arrived to assist in...whatever this is! Needlegal: This is all our backup? Now I definitely want to leave. Galaxyman: Yahoo! I'm available! Let's catch that slime alien! Shadowman: It's not an alien. Galaxyman: You don't know that for sure! Shadowman: It's just one of Wily's creations. Galaxyman: Well maybe Wily found an alien and repurposed it. Shadowman: That's just stup-...oh right, I actually can't argue with that. Geminiman: Just get on with it! I can't believe I'm admitting this, but Snake's plan sounds...decent. Snakeman: Thanks. I had some time to think about it while the rest of you were down there fighting for survival. Geminiman: Bah. Just remember that if this doesn't work, you'd better teleport down here to die with the rest of us. Snakeman: Yeah, I'll get right on that. Spark Chan: Hey, it's working! Plugman: Wow, it's not happy. Hardman: Yeah, these guys don't like electricity, and it can't dodge your weapon as easily since it travels along the ground. Spark Chan: I'm awake! What'd I miss? Plugman: ... I'd get that checked out if I were you. Spark Chan: Whew! It's finally over! Concreteman: I'm gonna seal it up completely, just to be sure. Any job worth doing is worth doing right. Shadowman: Alright guys, let's go. It's time to figure out what all this got us. Shadowman: ...But before it showed up we DID find evidence that someone had managed to break into the vault and make off with those holo-helmets and who-knows-what else to sell on the black market. Crorq: "Who-knows-what else"? I would expect YOU to know! How much investigating did you actually do? Snakeman: That's the problem, aside from the things we saw the END Devil consume directly, we have no idea whether missing items were stolen or eaten. The security footage was no help since any of the cameras pointed at the goods were dissolved too. Snakeman: Wow, they have a database that detailed? Crorq: OF COURSE NOT, CRETIN! How gullible are you, really? Crorq: They're analyzing the creature's remains back at the prison, and have reported its structure is a bloated, unstructured mixture of several metallic elements linked in a polymeric latticework. Nothing distinctive of the assimilated materials remain. In other words, utterly useless in tracing it back to its component parts! Now is it possible nothing was stolen after all and the escaped END Devil sample simply destroyed everything in the vault by absorbing it? Shadowman: No, someone definitely bypassed the prison's security. There's the missing security footage to prove it. Crorq: That's merely evidence of missing security footage, not a theft. Shadowman: What about the holo-helmets? They came from the vault in the first place! Crorq: Or they were just additional units found in an old Wily lab, as I predicted earlier. Needlegal: Come on. Stolen Wily tech could be a big deal. Why are you trying to ignore it? Crorq: An unconfirmed quantity of weapons floating around the black market stolen from the Robot Prison's most secure storage facility? Now why would I not want to report THAT to the press? Hmmm. Why would I not defer to the much simpler, more palatable explanation that any Wily tech that pops up came from the madman's innumerable abandoned hideouts and the contents of the vault were harmlessly disposed? Could it be that I am mentally superior to you in every way? Crorq: I am sure these questions will keep you awake at night for a long time to come. Go now. Meditate. One day you may grasp at the straws of enlightenment. Crorq: Seriously, get out. I've got an easy story to feed to the press. Snakeman: So...did everything turn out all right, at least? Needlegal: Did we even manage to learn anything? Shadowman: Who are you asking? That's your job, isn't it? Needlegal: Well, we did learn that there WAS a hidden museum of war machines of days-gone-by, but there's not much of it left now, so what's the point? Hardman: We learned there are some missions Classi really doesn't want to be involved in. Snakeman: Why were you so eager to leave anyway? You were the best equipped to deal with that thing. Spark Chan: It was a gross ball of slime! If you'd seen it you'd want to get as far away from it as possible too. Magnetman: Yeah, I'd have to concur. Needlegal: I guess we also learned we could all be getting upgraded armor soon. Topman: Well, until the whole planet (except the stone parts) is converted to an undifferentiated amorphous mass, we are...The Mechanical Maniacs!